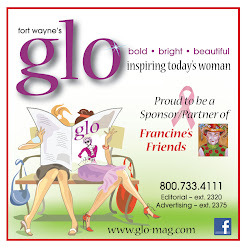 Francine's Friends: Important Mobile Mammography Update! 5.15 LATEST UPDATE - we are back up and running! To schedule an appointment, please call the scheduling line at 260.266.8120. The Francine's Friends Mobile Mammography coach is currently having its generator replaced. Due to this repair work, many locations have changed. If you have an appointment for a mammogram on the Francine's Friends coach and have not been contacted to reschedule, please call 260-483-1847 or 1-800-727-8439, ext. 68120. If your business or organization is hosting the coach and you would like to confirm a scheduled visit of the mobile mammography coach at your site, please contact Breast Diagnostic Center at 260-266-8120 or email debi.kennedy@parkview.com. We apologize for any inconvenience — the coach will be back on the road very soon!